The Vehicle Rider Indemnity Agreement is for a rider in a company vehicle or on company business indemnifying the company from anything happening while they are riding in or driving a company owned vehicle. along with a contract goes to show your professional standards and it is the only way for all parties to come to an agreement about the project. For a long time I’ve been searching for a package out there that would offer me both the professional look and flexibility I deserved. Proposal Kit reaches and exceeds my expectations with a solid suite of products that helped my business grow." This Vehicle Rider Indemnity Agreement is included in editable Word format that can be customized in Word or by using the included Wizard software. How do you write a Vehicle Rider Indemnity Agreement document? I, the undersigned, do hereby agree to defend, indemnify and hold harmless Company Name, its officers, agents, directors and employees from and against any and all claims, demands, expense, liability or lawsuit arising out of any injury or death to any person, or the damage, loss or destruction of property which may occur directly or indirectly, including any act or omission by myself or any and all costs, expenses and legal fees, investigative cost, or any and all expenses incurred by Company Name as a result of any claim, demand, or causes of actions arising out of my presence as a passenger in, or my driving a Company Name or personally owned, borrowed or leased vehicle, including any vehicles rented or leased by Company Name or an employee and being used in connection with Company Name business. Thus done and signed on the day of, 20XX. WITNESS: (Note: Must be Company authorized witness). 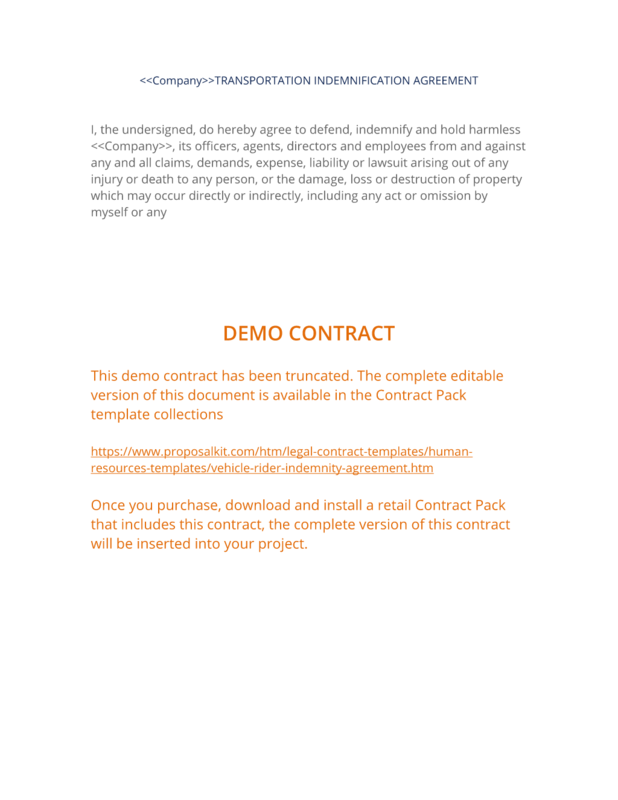 The complete Vehicle Rider Indemnity Agreement - with the actual formatting and layout - is available in this Contract Pack.